If Jake gets the idea to produce dials, and handsets too; then were talking about a whole new ballgame! Lightly moded, but just what I was looking for. Boris_bvg bezel with a Seiko insert and black date wheel from Meranom. linuxs, taimurkhan, tokareva and 3 others like this. 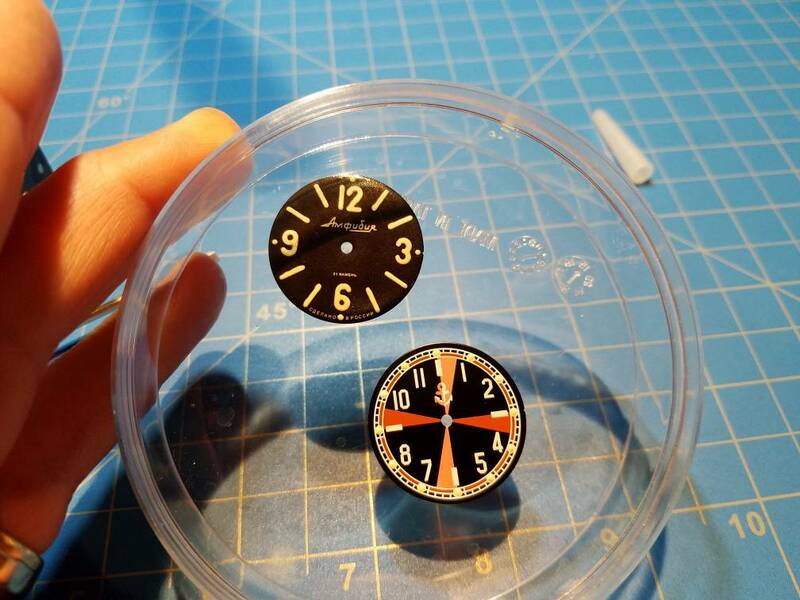 Here we have some ordinary looking Vostok dials. When we turn off th...KAPOW! The 3-6-9 dial is my first attempt at luming outside the dots. Decent for a 1st try I suppose, though the circle on the 6 bothers me. 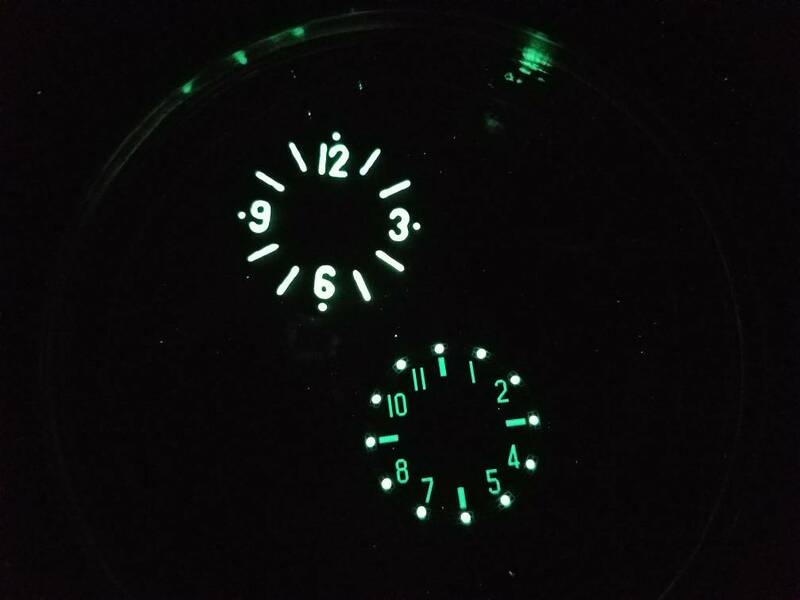 Lume charged around 10:30p last night & 8 hrs later they could still just faintly be seen in a dark room. I tried tinting with creme water color, but it didn't mix well (what you see is not tinted). I have heard of others using makeup powder, but I imagine that would achieve similar results. Next time I might put a speck of thinner (or water) in with the watercolor beforehand. 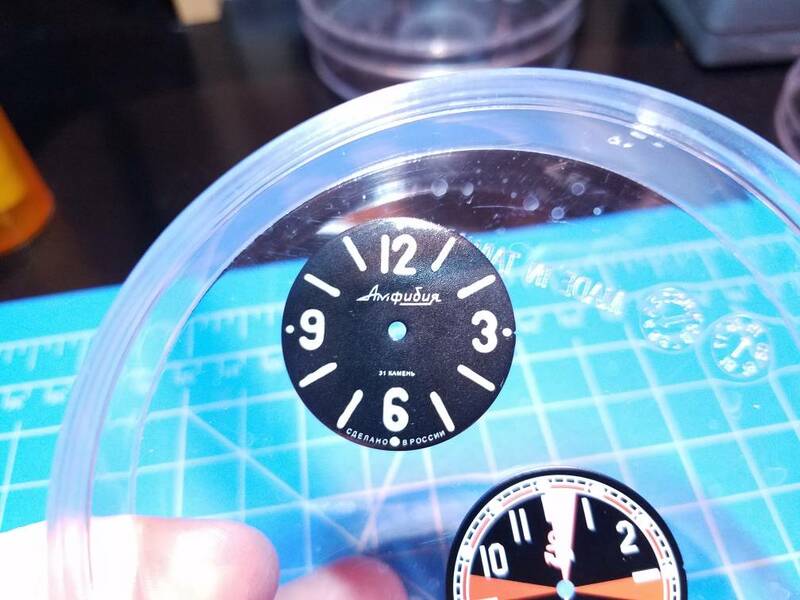 I broiled the dial for a minute or so beforehand, but it only turned the indices a scant shade darker & seemed to make the black look more wet which I didn't like - the indices also seemed a little less defined as if they had melted (surprise) into the dial. I tried first on a modern white dial that still had dried tea residue on it & the tea on it definitely turned darker fairly quick with no apparent changes to the rest of it. 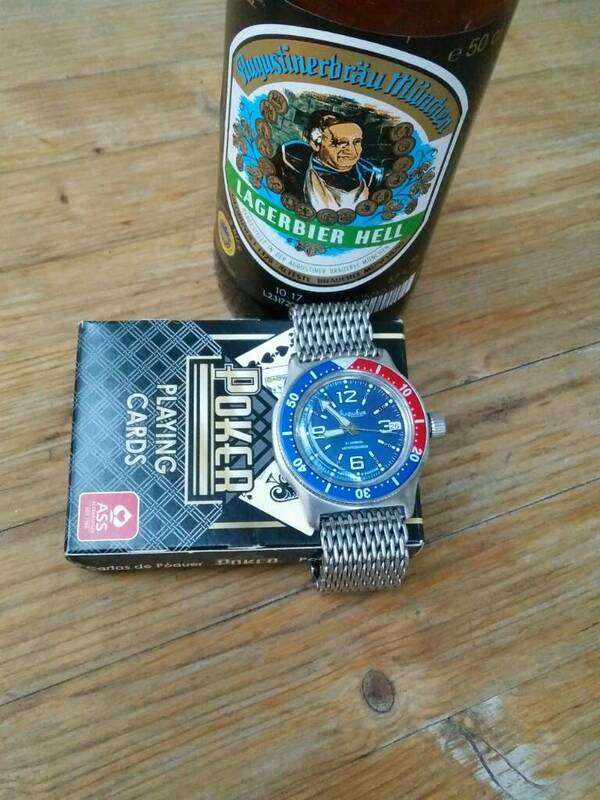 I also toasted a Soviet brown sunburst dial & the paint bubbled up on the top 1/2 of the dial. I think lower heat & longer times may be better for more subtlety (surprise). little_w, Ticonderoga, taimurkhan and 9 others like this. How did you manage to get the lume so even on that sniper/radio room? The numbers have way more sharp edges and yet it looks much cleaner. Good job! 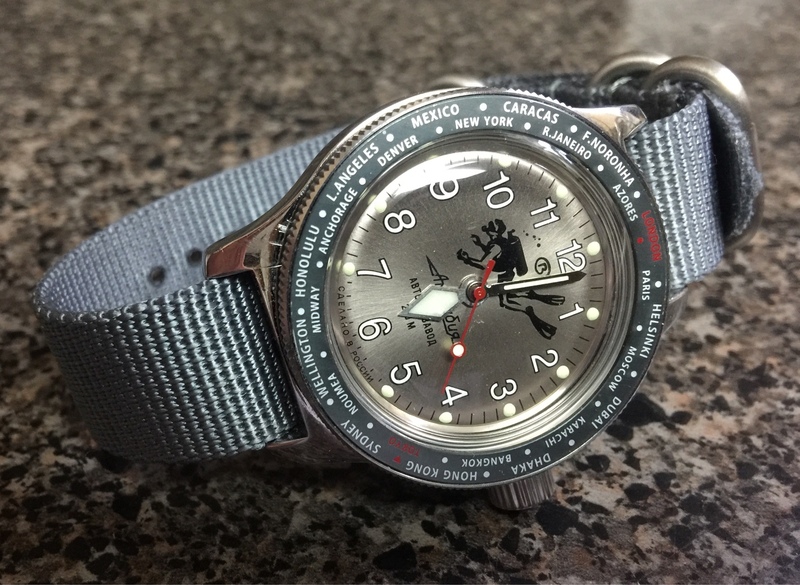 I only lumed the dots on that dial. 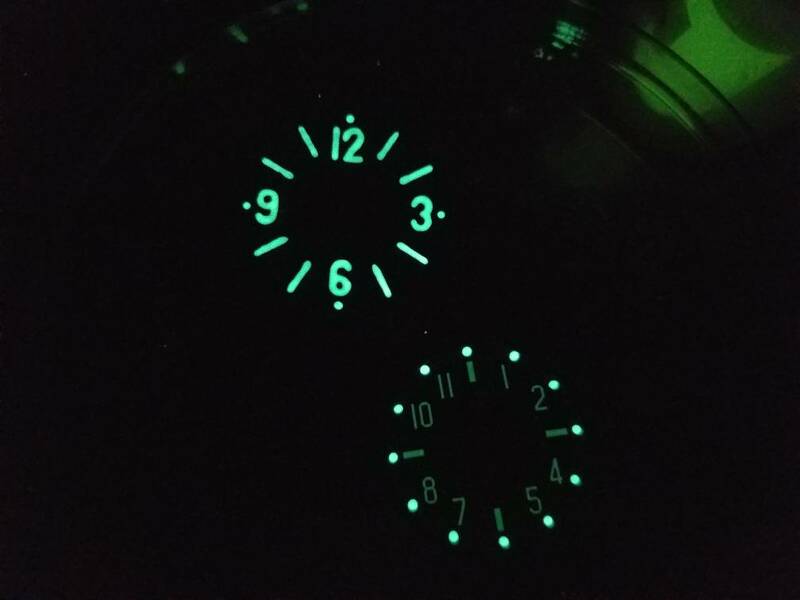 The numbers on the RR dial have only factory lume as you can see it is not as bright & fades faster than the other. Changed this guy up a bit. 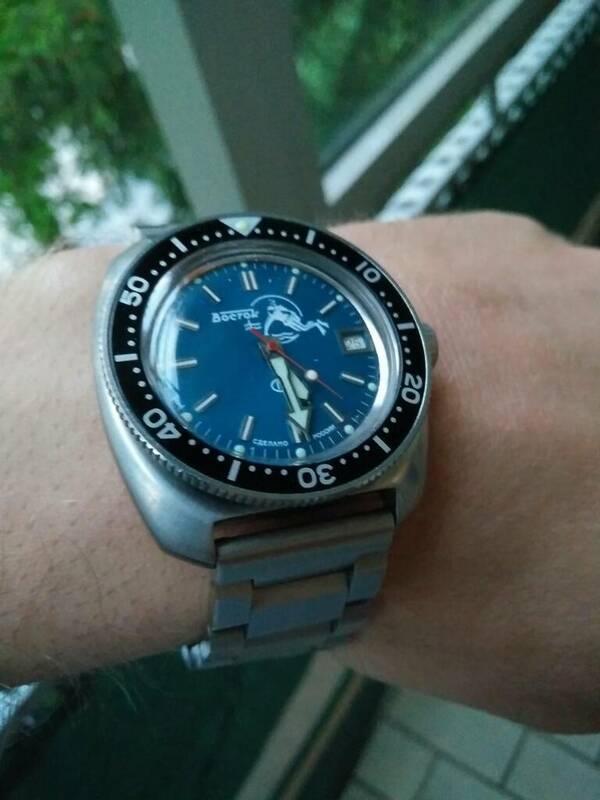 Swapped insert to the "Tokyo GMT" from Dr. Seikostain, and hands from Igor. linuxs, Ticonderoga, igorIV and 2 others like this. eyeamgrewt and nitroproof like this. Nice job , which lumen do you use ? Last edited by DocTone; May 28th, 2017 at 08:23. Thank you. 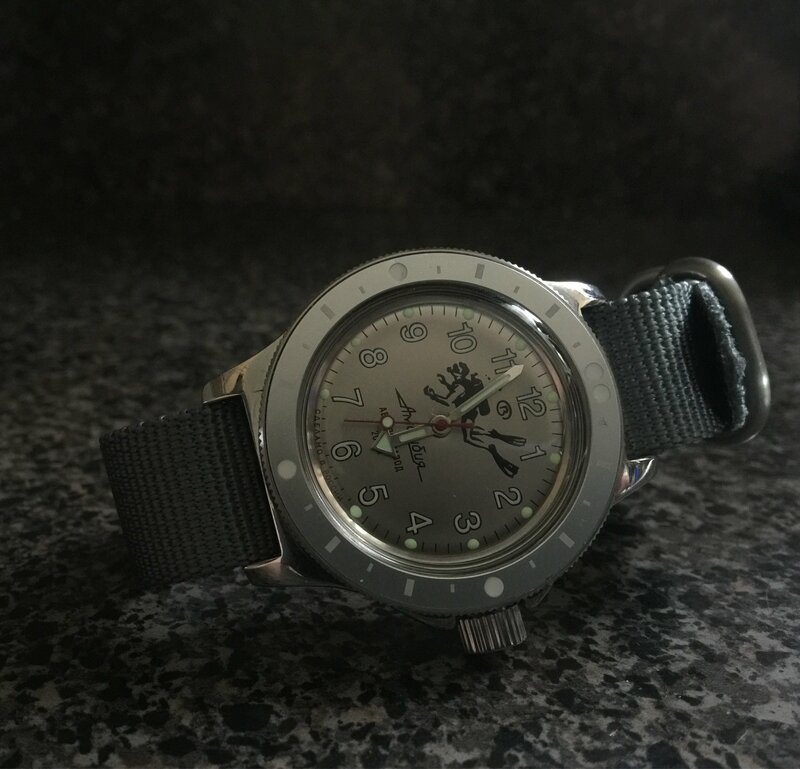 3501 Luminova produced by Herr Ranfft.